Trends: Splashlight, the unexpected colour! The spot light in the middle of the hair. Inspired by the popular tie & dye, the Splashlight is to provide a halo of light in the middle part of the hair. he principle is simple: darker on the roots and tips, lighter on the mid lengths. You'll understand the halo comes from inside and is seen even when the hair is moving. This highlighting band acts as a ray of light and comes around the face in bringing brightness and shine. Strange surroundings, the Splashlight has remarkably seduced the fashion addicts and fan of selfie. 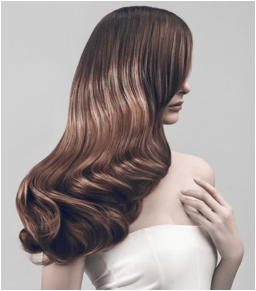 From the contrasted the most natural Collection Hair reveals all the possibilities for this unusual light setting. Jean Louis David is willing to create golden shading off into each other where we can admire each different tone. Here is the original laser beam that Redken grabbed as a clear and distinct result. Sweetness and originality for this graphic and futuristic hairstyle, such audacity Eugene Perma ! 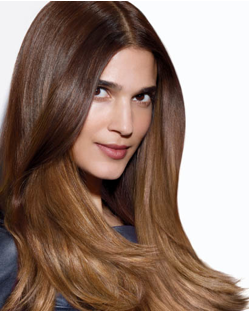 Matrix takes the freedom to highlighted intermediate lengths till the ends to a soft and light result. All coverd by copper and discretion, Intermède tone down a brown and intensify its reflections. A perfect spot of light that brightened wavy and straight hair, a beautiful interpretation by Redken . L'Oréal plays with shines providing a veil of transparency, like a refined and sophisticated picture. To enhance a natural hue Saint Algue brings two-tone colour scheme: golden and copper which seem to match amazingly. 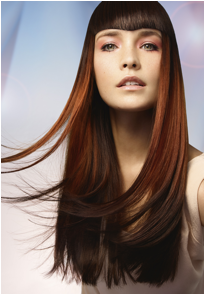 Like it has gone blonde by the sun, a soft halo of light shapes a natural effect, signed Redken . Fabio Salsa sets warm colours with a sensible brightening to bring shine and vitality. Through the halo coming from inside the hair, Jean Louis David brings some character with this brunette bangs underlining a highlighting around the face. 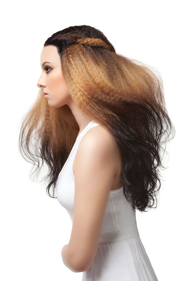 Crimped hair features a superb contrast brown to blonde, a daring challenge that Scruples succeeded admirably.